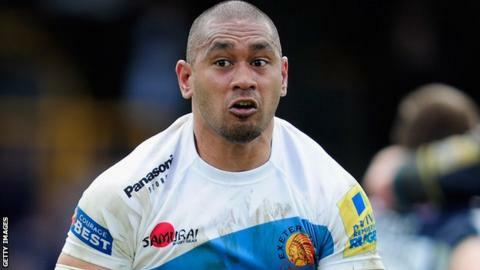 Exeter scrum-half Junior Poluleuligaga has joined Cornish Pirates on loan as cover for injured captain Gavin Cattle. The 31-year-old Samoan has not featured for the Chiefs this season and made only three appearances last campaign. His chances have been even more limited with Will Chudley joining alongside Kevin Barrett and Haydn Thomas. "It's a fantastic opportunity for Junior to play what we believe is high-level rugby," Exeter boss Rob Baxter told BBC Radio Devon. "It's very difficult for scrum-halves and fly-halves to come into the team when they're not playing regularly. "With Will Chudley coming in and doing so well and Haydn back from injury and Kevin Barrett doing well an opportunity has arisen for Junior to get some extended game time at Cornish Pirates," Baxter added. The former Waikato Chiefs and Harlequins player has struggled to force his way into the Chiefs line-up since moving to Sandy Park in 2010. Last season he made just one start in a LV= Cup match with Bath, two replacement appearances and one appearance off the bench for Samoa at last year's World Cup. In 2010-11 he made eight starts, including three in the Premiership.